Senior Iranian officials are accusing the United States of violating the landmark nuclear accord and promising to take punitive measures against America for this action, according to recent comments that come on the heels of renewed efforts by the Trump administration and Congress to sanction Tehran for its ballistic missile program and regional support for terrorism. Ali Larijani, speaker of Iran's parliament, lashed out Tuesday at the Trump administration and accused it of "blatantly" violating statutes in the nuclear agreement that obligate the United States to promote international trade with Iran and refrain from issuing new sanctions. Larijana promised that Iran would "act decisively" to retaliate against the United States with its own package of sanctions and other measures, according to comments by the senior leader. Iranian President Hassan Rouhani threatened that American "will be harmed" by its recent moves. The comments are likely to escalate tensions between the Islamic Republic and Trump administration, which recently came very close to explicitly labeling Iran as in violation of the nuclear deal. The White House has repeatedly sanctioned Iran's ballistic missile program and U.S. officials have vowed to continue confronting Iran's regional hostility, particularly in Syria, where Iranian-backed forces have launched several direct attacks on U.S. coalition forces in the region. A State Department official, speaking only on background, told the Washington Free Beacon that the comments by Iran's leaders will not deter the Trump administration from continuing to sanction Tehran. The U.S. government intends to continue to target Iran's malign activity that is outside the scope of the nuclear deal, the officials said, referring to U.S. action against Tehran that is viewed as not directly violating the agreement. "We have been clear all along that there would continue to be sanctions on non-nuclear areas," the officials said. Iranian leaders continued to bash the United States on Tuesday, following the recent round of sanctions imposed by the Trump administration and Congress. Rouhani issued a warning to the United States as the Iranian parliament considered emergency measures to retaliate against the United States. "The Americans should know that they will be harmed more by such moves, as such acts will isolate them in the world," Rouhani was quoted as saying. Larijani, speaker of Iran's parliament also accused the United States of violating the deal. "Given the evidence, in our view in the nuclear committee (which supervises implementation of the nuclear deal) the Americans have blatantly violated the nuclear deal," Larijani was quoted as telling reporters Tuesday in Tehran. "Mr. Trump advised other countries not to invest in Iran; such remarks are against the nuclear deal and such an atmosphere shouldn't be created based on the agreement," Lirijani was quoted as saying. 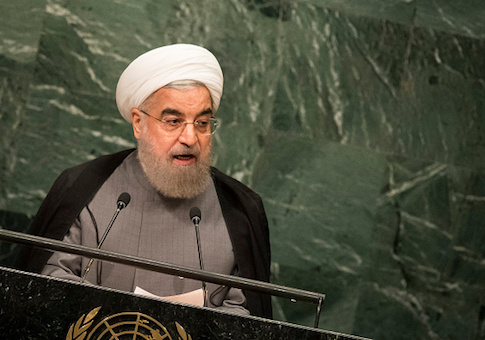 "Iran should act decisively and wisely to prevent the Americans from attaining their goals." Iranian Foreign Minister Javad Zarif, who negotiated the nuclear deal, also accused the Trump administration of violating the agreement and vowed that Iran would continue its work on ballistic missile technology, which it claims does not violate international accords baring such activity. The U.S. State Department, however, disagrees with this characterization and accused Iran of being in breach of United Nations resolutions that call on Iran to refrain from testing and constructing ballistic missiles. Iran—which conducted a major space launch last week—has been steadfast about its commitment to pursuing advanced missile technology, an issue that has emerged as a flashpoint between Tehran and the United States in recent months. "Iran, unlike the U.S., has complied in good faith with the letter and spirit of the JCPOA, while U.S. rhetoric and measures indicated its bad faith," Zarif was quoted as saying this week. The Iranian body responsible for governing the nuclear agreement also moved on Tuesday to take action against the United States, claiming that the United States had violated several provisions of the accord. The body drafted a bill titled, "Confronting the United States' Acts of Exploitation and Terror in the Region" and also issued a 16-paragraph document outlining how Tehran would "respond accordingly to U.S. provocations," according to reports in Iran's state-controlled press.